Shows the layout of Melbourne streets circa 1866 with buildings, the Yarra, Port Phillip Bay in distance, parts of Collingwood and East Melbourne. Creator: De Gruchy & Leigh, lithographer. Dimensions: 59 x 93 cm., in frame 83 x 113 cm. 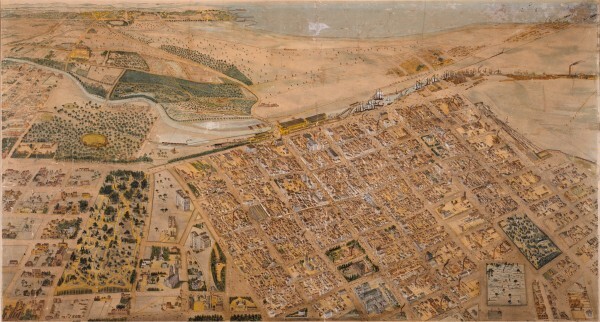 Contents/Summary: Shows the layout of Melbourne streets with buildings, the Yarra, Port Phillip Bay in distance, parts of Collingwood and East Melbourne. Black and white photographic copies H23932, H29613. Title and date from plaque on frame l.c. Key to plan at H6091. Melbourne (Vic.) -- Pictorial works.